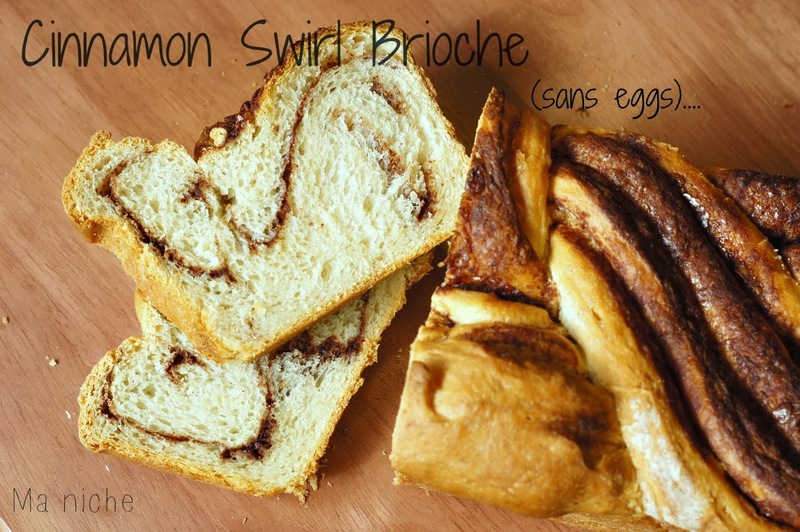 Ma Niche : Cinnamon Swirl Eggless "Brioche"
This month Gayathri of Gayathri's Cook Spot challenged the members of the Eggless Baking group to make an eggless version of Barbara's Cinnamon Swirl Brioche. My first reaction after reading her mail was, "What ? 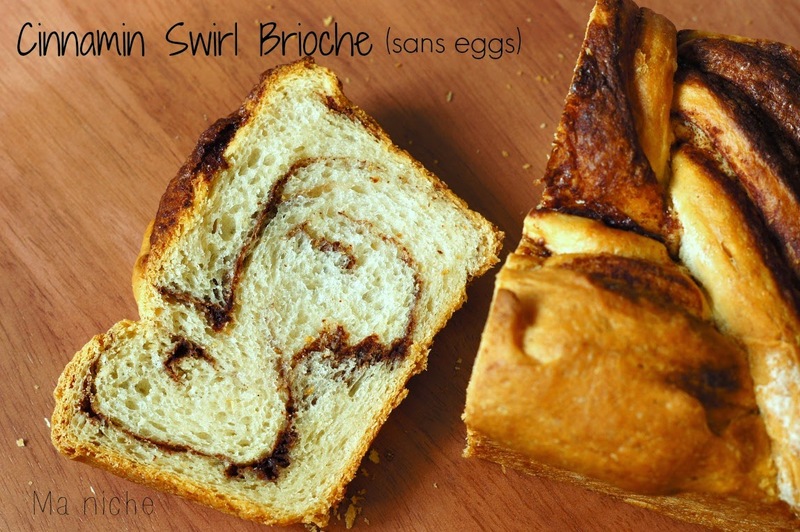 Brioche without eggs ? Really ? " 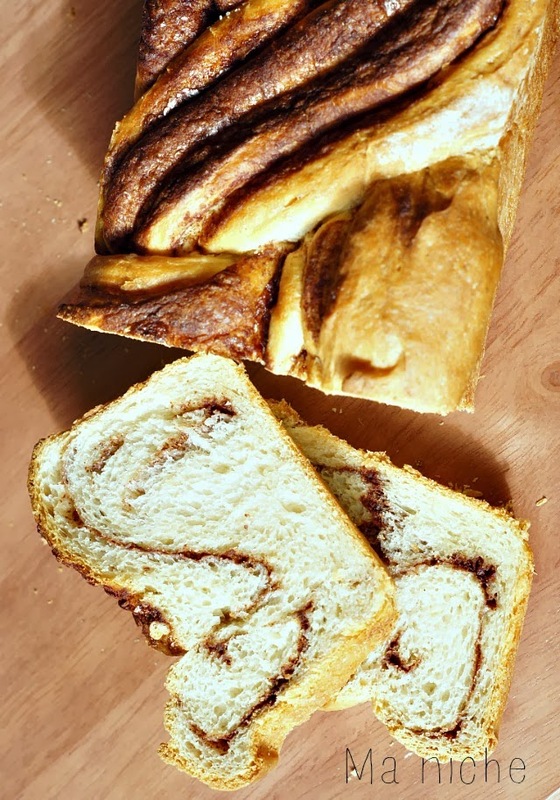 Initially I had decided to skip this challenge... but the pretty cinnamon swirl and the simplicity of the recipe kept bringing me back to it until I finally decided to give the eggless version try. I usually use the combination of yogurt and baking soda to make an eggless version of an eggy bread. However the mere substitution felt a little inadequate for an eggless version of brioche. After all it was brioche.. and no ordinary bread. How could a simple substitution render the bread its richness and textural lightness. I discussed with my mother and she suggested an extra helping of yeast. Okay. I said and pondered a little more... until I remembered Reeni's review about the scalded flour method. She had used the method for making a Scandinavian White Bread and had compared its texture to a brioche... I decided to modify the method to adapt the given recipe..
You see, the scalded flour method(SFM) requires one to make a starter of scalded dough which is cooled and then kneaded together with the remaining dough ingredients to make the dough for the bread. This meant, involing the SFM would add an extra step to the suggested recipe from Artisan Bread in Five Minutes a Day, thereby depriving it off its ease and simplicity, the two things that had attracted me towards this bread at the first place. I thought for a while and then decided to try a simple modificaion. Instead of making a scalded dough starter, I decided to beat the yogurt with boiling hot water, then quickly stir in the remaining ingredients including the flour to the hot yogurt. I am not sure if that little step helped, or if it was just the right proportion of liquid to flour, but things suddenly fell into place and soon I recognized the dough as brioche-like... soft, flow-y and unmanageable. Thereon I followed the given recipe and was duly rewarded with a lovely loaf the following day. Stir in the remaining ingredients except the flour into the yogurt solution. Finally using a spoon incorporate 2 cups +2 tbsps of the flour into the mixture. Cover the container and let it rest at room temperature until it doubles and then collapses, about 2 to 2 hour 15 minutes. Refrigerate container for 6 hours. Now knead in the remaining ½ cup of flour, cover the container and refrigerate overnight or atleast 8-9 hours. When ready to bake, mix the confectioner's sugar, ground cinnamon and salt, over a lightly floured surface, roll outer the the refrigerated dough into a 8 × 15 inch rectangle. Brush water or melted butter over the rolled out surface. Sprinkle the cinnamon sugar mixture evenly over it , press it lightly with a parchment paper. Starting on the shorter side, roll the dough into a cylinder, seal the seam. Refrigerator the rolled cylinder for an hour. Take the log out and place over a floured surface. Now using a sharp knife, cut the cylinder lengthwise into two halves. Turn the halves so that the cut sides are facing up. Pinch the two ends of the dough together and entwine the two halves, with the cut sides facing up, until the two pieces are tightly twisted. The pinch the other end. Now place the dough log in well greased 9 × 5 inch loaf pan, cover loosely with a plastic sheet or a kitchen towel and allow to rise until doubled, about 1½ hours. Meanwhile center the rack and preheat oven to 375 ° F.
Once the dough doubles, reduce the heat to 350 &deg F and bake the loaf for 25-30 minutes, until the crust is golden crust. Then reduce the heat further to 325° F, tent the loaf with a foil and bake for another 20-22 minutes until the bread comes off from the walls of the loaf pan. Cool the loaf in the pan for 5 minutes before taking it out and cool completely, about 2 hours before slicing it. Thanks Gayathri for suggesting the recipe and introducing me to the methods ofArtisan Bread in Five Minutes a Day: The Discovery That Revolutionizes Home Baking . Brioche without eggs, wow :) this bread is totally calling me. I know Brioche without eggs :).... but I am really happy with the way it turned out. wow perfectly braided brioche :) looks fabulous dear !! Thanks Manjula... I was a little intimidated by the braids in the beginning. glad they turned out the way they did. wow!so perfect and looks spongy! Thanks Amila. the texture was quite nice. I really enjoyed this bread. Your bread looks beautiful…amazing you could make this gorgeous bread without eggs! Thank you so much Kathy.I am really happy with the way the loaf turned out. Who knew you could make eggless brioche??? It looks divine!!! So true. I was really intimidated by this challenge. Beautiful Brioche, and I am sure will be delicious! Thanks so much for sharing with Full Plate Thursday, it is so nice to have you with us today. Have a great weekend and come back soon! Thank you Miz Helen. The bread was really delicoius. wow this is differently made. I never use eggs in bread baking so this method of using yogurt is new to me. Thanks. Yes Archana, I was trying to combine two methods. The loaf turned out well.. Planning to experiment a bit more along the same lines. You probably see more of the scalding flour method on the blog. 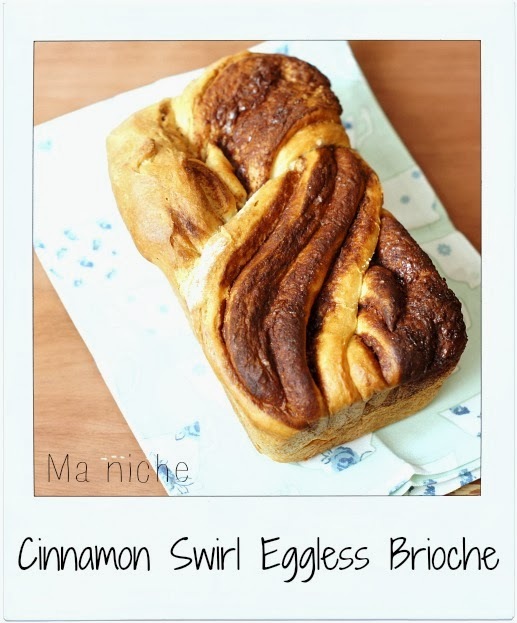 That's a unique challenge - brioche without eggs and you've certainly achieved it. The texture looks wonderful!! Thanks Winnie ! It was a challenge indeed. glad the way the loaf turned out.